The rain didn't stop last night, and by daybreak it was coming down in buckets. 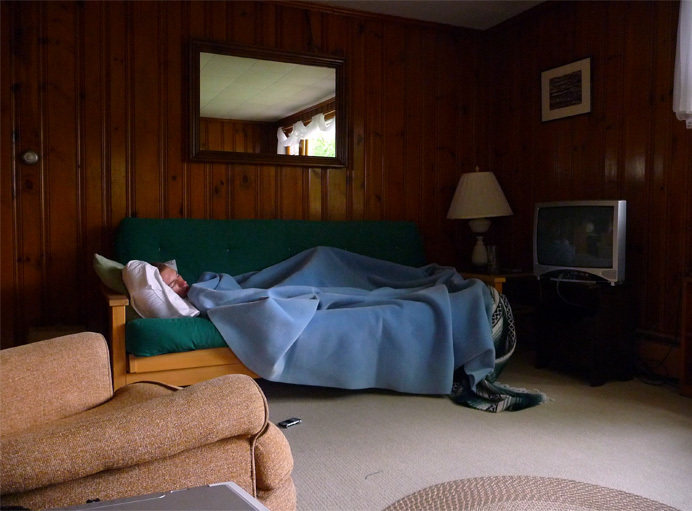 My 25-year-old son Bill decided to sleep in. I find it amusing to guess when a house was built by analyzing its furnishings. In this case, I'm betting early mid- to late-1950s because of the knotty-pine paneling, the ceiling tiles (reflected in the mirror at top-center), and the lumpiness of the armchairs. The futon, circa 1980, was surely a late addition. .